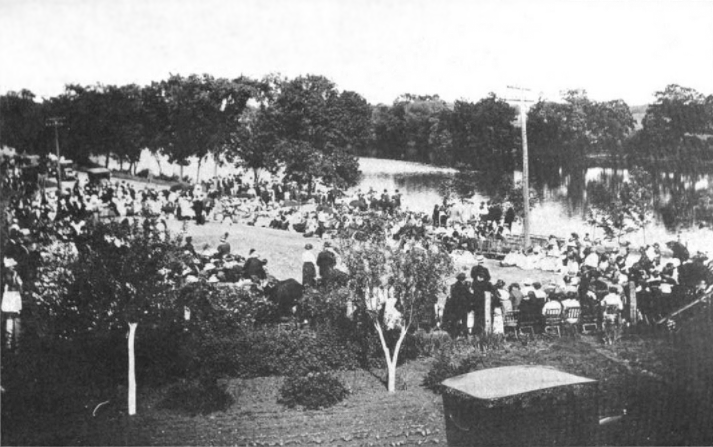 (197) "A picturesque revival of the early Indian days was portrayed in the pageantry of Indian dance and song presented on the bank of Rock River just west of the city of Fort Atkinson on the highway between Fort Atkinson and Koshkonong, Saturday afternoon, June 5[, 1920]. The occasion was the unveiling of the tablet in formal dedication of the Indian intaglio effigy ... This effigy, a monument of the profound religion of the Indians, is the only remaining memorial of its class known to occur in Wisconsin. This effigy, in contrast to the more frequent Indian effigy mound, is excavated several feet deep, the shape being that of the numerous 'panther' type mounds. Its length from the head to the tip of its tail is 125 feet." (206) "We who are of America's first children are returned to our former home just for today, in obedience to your wish that the Indians themselves might be here, might know that this the only remaining monument of our ancestors is still sacred ground. ... (207) And our mounds, monuments of an ancient people; there were seventeen in this group; now not one remains; all have been destroyed. But I am rejoiced that this sunken image, which our ancestors have carved out of the bosom of mother earth, still remains. Our young men and maidens honor the work of their ancestors, and today bring garlands and flowers to offer to its spirit. Long and faithfully did they labor to carve out from the (208) soil this silent figure of the Wichawa, the panther, most powerful and guardian spirit of our Winnebago village. Once in the long, long ago, a good Winnebago stood on the bank of the river, offering his devotions to the Wakanda, and fasting 20 days. Then he saw an animal rise to the surface of the water, it was a Wakanda, a water spirit. It had heard the Indian's story of his troubles and told him that it would help him and that his life thereafter would be long and happy. Then many other Indians saw the animal. As our ancestors desired its future protection and guidance, they constructed near this village, and among those of other wakandas, its likeness. Commentary. "Wicawa" — for wičąwą́, "wildcat, panther." "Wakanda" — this is an Ioway-Oto word, which can be used to reference the creator god, or some ill-defined spiritual power, but it is not a Hočąk word. C. E. Brown, as I have pointed out before, had a penchant for using wakanda to denote a Spirit being, running the gamut from Earthmaker to Trickster; but here "the Wakanda" seem to denote nothing more than the resident Spirit, in this case the so-called "panther." The word for which he is here substituting wakanda, is the Hočąk Wakjexi, conventionally translated as "Waterspirit." "likeness" — the intaglio mound has a resemblance to a "panther," by which is meant a cougar/puma/mountain lion. The bobcat and lynx are known as wíčawą́ sį́č kųnų́k, "short-tailed wičąwą́," whereas the mountain lion is known as wíčąwą́ sį́č seréč, the "long-tailed wičąwą́." Since the effigy is really that of a Waterspirit, it will necessarily have a long tail, as such a feature is essential to its nature, representing as it does the natural tendency of flowing water to form a long, narrow channel. Waterspirits in the form of panthers are quite common among the Algonkian tribes, where they are often termed "Underwater Panthers," but not so among the Hočągara. Nevertheless, the Hočągara do recognize that Waterspirits can have a multiplicity of identities, Beaver-, Elk-, and Bear-Waterspirits have been attested. Therefore, the notion that there are Wičąwą́-Wakjexi is perfectly in accord with accepted notions among the Hočągara, although the panther variety has yet to be mentioned elsewhere. The clans themselves had disintegrated by this time, as the informant incorrectly thought that a Decora could belong to the "Panther" Clan, and that there was even such a clan at all. He seems not to have known the Hočąk name for Waterspirits, and did not know that the Panther Clan would have actually been the Waterspirit Clan. However, the old people did remember these things correctly. "here" — a special place where communication with Spirits is accentuated can be referred to as a mą́woja. This word comes from mą, "earth, ground"; and woja, "to be fruitful." Mą́woja is "fruitful ground," which in a mundane context means somewhere where flora may flourish; but in a sacred context is may refer to either a place where holy relicts are left, or offerings are often deposited; or, as is seen elsewhere, where the communication is in the other direction, the earth is fruitful by virtue of being a place where a supplicant is more likely to receive a blessing from certain Spirits. "the spirit of the panther" — that is to say, the Waterspirit. However, the matter is complicated. Although the "panther" is fundamentally a Waterspirit here, we cannot exclude it from also being a Wičąwą́ Spirit as well. This complex union of spiritual attributes, which we have seen elsewhere with the Bear-Waterspirit, gives such hybrid-like Waterspirits special powers by virtue of their somatic configuration, however much they remain most essentially Waterspirits. "the Panther Clan" — there is no such clan, so it is clear in this context that "panther" means "Waterspirit." That there might be a Panther Subclan, for all we know, is not impossible, but given the rarity of the Panther-Waterspirit, it seems unlikely. The only Waterspirit subclan that we know of is the Beaver Subclan, and from this we might expect the other three subclans to hold to aquatic creatures exclusively. Stories: in which Waterspirits occur as characters: Waterspirit Clan Origin Myth, Traveler and the Thunderbird War, The Green Waterspirit of Wisconsin Dells, The Lost Child, River Child and the Waterspirit of Devil's Lake, A Waterspirit Blesses Mąnį́xete’ų́ga, Bluehorn's Nephews, Holy One and His Brother, The Seer, The Nannyberry Picker, The Creation of the World (vv. 1, 4), Šųgepaga, The Sioux Warparty and the Waterspirit of Green Lake, The Waterspirit of Lake Koshkonong, The Waterspirit of Rock River, The Boulders of Devil's Lake, Devil's Lake — How it Got its Name, Old Man and Wears White Feather, The Waterspirit of Sugar Loaf Mounds, Lakes of the Wazija Origin Myth, Waterspirits Keep the Corn Fields Wet, The Diving Contest, The Lost Blanket, Redhorn's Sons, The Phantom Woman, Įčorúšika and His Brothers, Great Walker's Warpath, White Thunder's Warpath, The Descent of the Drum, The Shell Anklets Origin Myth, The Daughter-in-Law's Jealousy, Snowshoe Strings, The Thunderbird, Hare Retrieves a Stolen Scalp (v. 2), The Two Children, The Twins Join Redhorn's Warparty, Earthmaker Sends Rušewe to the Twins, Paint Medicine Origin Myth, Waruǧábᵉra, Ocean Duck, The Twin Sisters, Trickster Concludes His Mission, The King Bird, The Medicine Rite Foundation Myth, Great Walker's Medicine (v. 2), Heną́ga and Star Girl, Peace of Mind Regained, How the Thunders Met the Nights, The Spiritual Descent of John Rave's Grandmother, The Boy who was Captured by the Bad Thunderbirds, The Shaggy Man, The Woman who Married a Snake (? ), Hare Secures the Creation Lodge, Ghost Dance Origin Myth I, The Sacred Lake, Lost Lake. 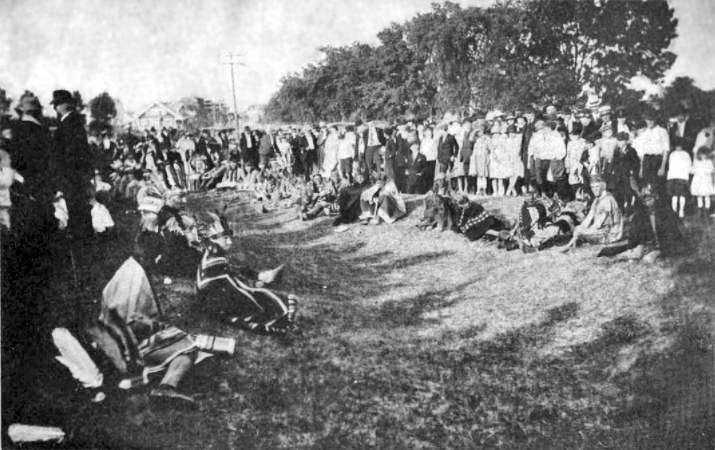 Themes: a person who fasts receives blessings from the spirits: The Blessings of the Buffalo Spirits, The Boy who was Blessed by a Mountain Lion, The Nightspirits Bless Jobenągiwįxka, Ghost Dance Origin Myth I, Redhorn's Sons, The Boy Who Became a Robin, The Woman Who Fought the Bear, The Seer, Maize Comes to the Hočągara, The Warbundle of the Eight Generations, The Woman who Loved Her Half-Brother, The Boy who would be Immortal, The Thunderbird, Great Walker's Medicine, Šųgepaga, Earthmaker Blesses Wagíšega (Wešgíšega), The Man Who Would Dream of Mą’ųna, Heną́ga and Star Girl, A Man's Revenge, Aračgéga's Blessings, The Blessing of a Bear Clansman, The Man who was Blessed by the Sun, The Girl who Refused a Blessing from the Wood Spirits, Buffalo Dance Origin Myth, The Man who Defied Disease Giver, White Thunder's Warpath, A Man and His Three Dogs, The Oak Tree and the Man Who was Blessed by the Heroka, A Waterspirit Blesses Mąnį́xete’ų́ga, The Meteor Spirit and the Origin of Wampum, The Diving Contest, The Plant Blessing of Earth, Holy Song, The Tap the Head Medicine, The Blessing of Šokeboka, The Completion Song Origin, Paint Medicine Origin Myth, The Nightspirits Bless Čiwoit’éhiga, Sunset Point, Song to Earthmaker, First Contact (v. 1), The Horse Spirit of Eagle Heights. 1 Harriet Wheaton and Charles E. Brown, "The Dedication of the Fort Atkinson Intaglio," The Wisconsin Archaeologist, 19, #4 (November, 1920): 197-208 [206-208]. 2 Arlow B. Stout, "The Winnebago and the Mounds," The Wisconsin Archaeologist, 19, #4 (Dec.-Feb., 1910): 101-102.